Moscow has a new motto: work a little harder, steal a little less. A big name may have just fallen foul of it. 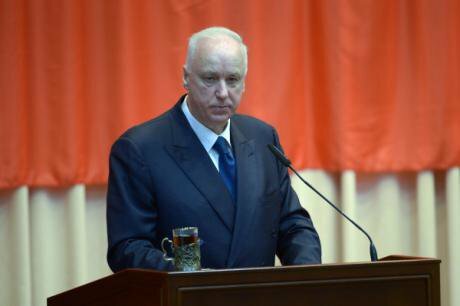 Bastrykin gives a speech at an assembly of Russia’s Investigative Committee. Moscow, February 2016. (c) Aleksei Nikolsky / Visual RIAN. All rights reserved.The word is that Aleksandr Bastrykin, head of Russia’s Investigatory Committee, is to step down after parliamentary elections this Sunday. For now, it’s just a rumour. Indeed, it could be a political manoeuvre against the head of this powerful (and independently-minded) state agency, which was set up in 2011 to combat police misconduct and investigate local and federal-level authorities. But once serious Russian news sites start stating something as fact, it tends to mean that the decision has been made. Given that the departure of Bastrykin’s often-vitriolic spokesman Vladimir Markin has already been confirmed, Bastrykin’s own departure seems probable. Bastrykin was always in a precarious position — Putin’s political attack dog yet never one of the pack. He created the independent investigative committee by wresting control away from the General Prosecutor’s Office, making an enemy of general prosecutor Yury Chaika at the same time. In many ways, Bastrykin set the committee up as a rival to Russia’s powerful Federal Security Service (FSB), though Bastrykin never established good relations with the Ministry of Internal Affairs (MVD). He got to promote his choice of underlings, but never even managed to win much affection amongst them. A notoriously unpleasant boss, Bastrykin was prone to chew out his subordinates in public in good Soviet managerial style. Despite having studied law at Leningrad State University at the same time as Vladimir Putin, Bastrykin never had any real personal relationship with Russia’s president. In fact, he never built wider circle of friends and allies in Moscow — Bastrykin’s position depended on his being useful. To this end, the head of the investigative committee was always looking to be just ahead of the curve, seeking to hear his master’s voice before the words were spoken. Bastrykin was point man in the persecution of opposition leader Alexei Navalny. He also pulled back the investigation into the February 2015 murder of opposition politician Boris Nemtsov once it became clear that it was pointing towards Ramzan Kadyrov, leader of Chechnya. He even began espousing extreme and rather bizarre notions of Russian autarky and the need for an official “national idea”. Of late, though, the balance of use versus inconvenience has tipped away from Bastrykin. A Spanish investigation claimed organised crime links. Furthermore, the FSB recently arrested Denis Nikandrov, one of the investigative committee’s most senior functionaries and head of its internal affairs division. It was an embarrassment, but Bastrykin didn’t try to fight back, and was thus allowed not to share the blame. However, partly as a result of the Nikandrov investigation, more and more evidence has emerged about the extent to which Bastrykin’s investigative committee is beset not just by corruption, but by downright inefficiency. In this respect, Bastrykin’s departure probably reflects not so much the downfall of one individual as the latest move in a long-term, low-key campaign to renew the country’s elite, seeking people who will do their jobs a little better, steal a little bit less. In keeping with the etiquette of this polite purge, Bastrykin will probably be given some comfortable sinecure, just as Vladimir Markin is said to be heading to a senior position at hydroelectric company RosGydro. Indeed, Markin’s boss may well follow him. After all, what will perhaps be more telling that Bastrykin’s (presumed) departure will be the choice of his successor. One possibility is veteran investigator Major General (Justice) Igor Krasnov. A current deputy head of the Investigative Committee, Krasnov has been at the heart of several politically-charged cases in recent years, and has demonstrated both dogged persistence and an unusual degree of impartiality. (Krasnov brought the prosecution against ultra-nationalists from the Combat Organisation of Russian Nationalists, who were convicted of the 2009 murder of human rights lawyer Stanislav Markelov and journalist Anastasia Baburova.) He also led the initial investigation into the murder of Boris Nemtsov in 2015, and his transfer from the case after two months marked the end of the serious search for justice. 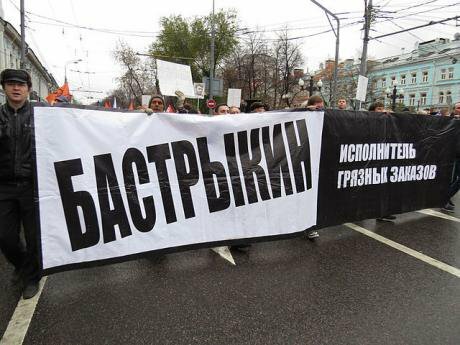 “Bastrykin: enforcer of dirty laws”, reads this banner at a 2013 march in solidarity with political prisoners in Moscow. CC: Putnik / Wikimedia Commons. Some rights reserved.Krasnov is something of a legend within Russia’s law-enforcement community. Several officers have praised him as a serious and dedicated investigator. 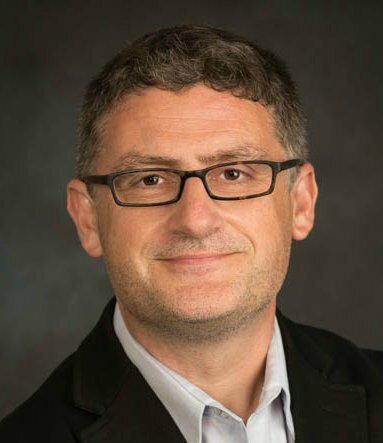 He cannot be considered wholly apolitical (no senior figure at his rank could not be), but nonetheless, Krasnov’s appointment would suggest a real and serious commitment to cleansing the Investigative Committee and thus using it as a force for a continued wider campaign against inefficiency and corruption. Another name being mooted is Georgy Poltavchenko, acting governor of St Petersburg. Another KGB veteran, who entered Leningrad (and then St Petersburg) politics during Putin’s stint as deputy mayor of the city, Poltavchenko has made a career spanning the city tax police and an unsuccessful run for the city council before his appointment as presidential plenipotentiary to the St Petersburg region, then presidential envoy to the Central Federal Region, before finally becoming acting governor in 2011. In other words, Poltavchenko has no serious or recent law-enforcement experience and a career as a loyal instrument of the Kremlin. This selection would suggest that Putin wants “Bastrykinshchina [Bastrykin-style policies] without Bastrykin” — for the Investigative Committee to continue as an organ of partial pseudo-justice and political repression, just with a less inflammatory figure at the top.